One of the key elements of Project Management which plays an important role in the success of any Project is the Management of the Relationship with various stakeholders. A stakeholder is any person or organization, who can be positively or negatively impacted by, or cause an impact on the project. A stakeholder can be someone who is directly involved in a project or have a specific business interest in the outcome of said project. The behavior of each stakeholder will depend up on their expectations with respect to the outcome of the project and the manner in which the Project Manager is trying to meet it. Therefore it is required for the Project Manager to understand the objectives of the stakeholders to effectively manage their needs. At the same time it is necessary to align the expectations of the stakeholders in line with the Project’s goal. By maintaining good relation with the stakeholders a Project Manager can almost certainly get benefitted in terms of cost savings and delivery scheduling which will directly aid in the success of the project. The most important factor which determine the strength of any relation is the communication. It is always advisable to have a Communication Strategy to achieve specific communication goals with each stakeholder. The communication goals can be set based on what you want each stakeholder to know and what you expect from each stakeholder. A communication plan in line with the communication strategy should be mutually agreed with each stakeholder and the Project Manager should always try to ensure that each stakeholder gets sufficient Project Visibility in accordance with the communication strategy. The most important stakeholder in any project is the Customer without whom the project would not have existed. The customer should be always kept abreast with the project developments in the best possible manner. Of course this does not mean that the Project Manager should reveal all the internal issues of the project. The information to be shared with the customer is to be in accordance with the communication strategy. Any major development which has an impact on the deliverables of the Project should be brought to the notice of the customer at an appropriate time so that necessary decisions can be taken on in order to achieve or redefine the project goals. Any suggestions or requests from the customer which has an impact on the Project with respect to time and cost should be discussed in a transparent manner with the customer and revisit the contractual scope and cost if necessary. The manner in which such issues, are handled greatly determines the relationship with the customer. On the other hand by maintaining a good relation with the customer a Project Manager can easily negotiate any such issues which have the potential to escalate and hamper the project success. The relationship with in the Project Team and that of the Project Team with other stakeholders plays an important role in the progress of the project. Any friction in this area will affect the day-to-day activities of the project which will in turn upset the entire project. An intelligent and experienced Project Manager will be able identify the frictions in any of the relations by analyzing the communications and the body language between the Project Team members as well as the Project Team and other stakeholders. A Project Manager with good people management skills will find it easy to tackle the challenges in this area. By organizing forums for formal and informal discussions among the Project Team as well as for the Project Team with other stakeholders, a means of better communication can be provided to them which can help building stronger relationships. Other important project relations which need to be closely followed and managed are the ones with the Investors and the Contractors. The investors are the ones who are ensuring the cash flow for the project and therefore they will have to be always kept informed about any important financial decisions which can impose a risk in the financial standing of the project. The primary motive of any investor is to gain profit out of their investments and any negative results in this area will cause a potential risk to their relationship with the project. The expectations of the investors should be clearly understood by the Project Manager and any risks associated with the same are to be communicated clearly to the investor at the earliest opportunity along with the proposal for the mitigation of these risks. In the case of contractors better relations can be ensured by rewarding them with opportunities to work together in future projects, for the quality of service provided by them. A successful Project Manager is one how has got a clear understanding about the relevance of maintaining good relationship with the project stakeholders for the success of the project. 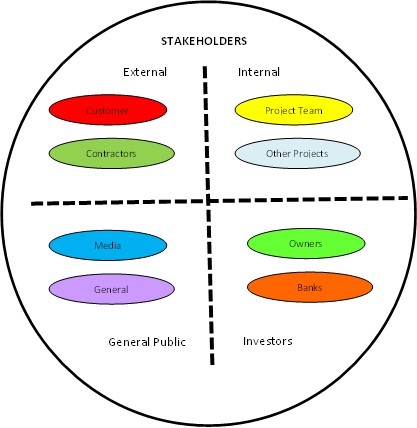 A stakeholder analysis may be carried out at the beginning of the Project, to map out the various stakeholders and evaluate the strategies to manage each one of them. A supportive stakeholder needs to be encouraged where as managing the relation with an unsupportive stakeholder needs delicate and tactful handling. In order to ensure successful outcome of the Project, a Project Manager should be adept in managing the relationship with various stakeholders of the project throughout the Project Management Processes.